1856, March 31 Otto Henry Bacher, born Cleveland Ohio. An artist, commercial and member of school of American Impressionists. In Venice meets James McNeil Whistler. On learning that Bacher has his own printing press and a collection of etchings by Rembrandt, Whistler made himself a regular visitor to Bacher’s studio. Bacher spends much of 1880 with Whistler, the two artists sharing etching techniques. 1883 January. Bacher returns to Cleveland setting up a lavish studio & begins to hold art classes. He leaves Cleveland for Paris in 1885 then to Venice. 1888 October 16, Otto Bacher marries Mary Holland of Cleveland, who had been a student of Bacher while he was teaching at The Cleveland Academy of Art. 1895 They settle in the art colony of Lawrence Park, Bronxville, New York. As an illustrator, Bacher was much sought after and did work for Scribner’s, McClure’s Century and other magazines. 1901 Otto Bacher is a founding member of the Society of Illustrators and Wins a prize at the Pan-American Exposition in Buffalo. Over twenty-four million men registered for the draft for the First World War in 1917 and 1918. There were three draft registrations, which eventually included all men (whether native born, naturalized, or alien) between the ages of 18 and 45. (*a.) All four Bacher brothers went to the draft registration on 5 June 1919, and registered as farmers. Eugene David studies agriculture at University of Illinois. Will Low studies art in the National Academy of Design, New York, follows in Father’s footsteps and studies art in Paris and Rome. (*a.) 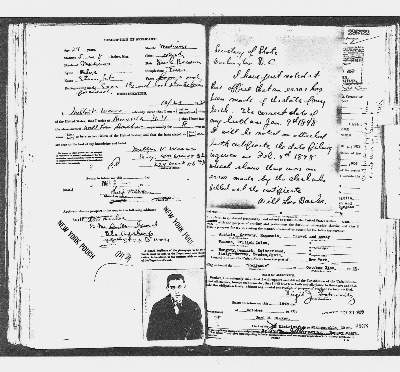 He applied for a Passport on 22 October 1922 to study in Europe, stating he would leave on the ship President Monroe on 25 October 1922, listing his occupation as "student". He returned on the SS Suffern out of Le Havre on 26 August 1924. 1927 September 27, Thirty Pennsylvania farmers, members of the poultry extension, will tour Orange County today which included a stop at the Bacher Brothers White Cloud Farm. 1927 Holland Robert Bacher starts a pottery on the family farm. Will Low makes the models and does the designing. 1928 the double-decker hen house with 2,500 laying hens catches fire with heavy losses. The laying hens are reduced to 500 in number. More time is given over to working in the pottery. 1928 Will Low Bacher files patent application for Bottoms Up Cup on August 23. H.R.Bacher is listed as president of White Cloud Farms, Inc.
the bottoms up cups in glass. 1929 Design patent # 77,725 is granted to Will Low his Bottoms UP cup, February 19. White Cloud Farms sues McKee Glass. Wins. McKee offers to purchase / lease patent rights. White Cloud agrees. 1929 McKee Glass Co., Jeannette Pennsylvania issues a ceramic bottoms up cup, in a boxed set of four or singles. The box is marked; “Bottom Up Cocktail Tumbler. The Laugh of the Party. " 1929 The Bachers purchase a $1,000.00 apple grading machine of the Oregon type, the first ever in the region. purchase of the Apple grading machine in a good indication. Stands upright, it is not know if this cup was ever produced in quantity. 1934 New York City. Rockefeller Center opens and includes White Cloud Pottery in a Permanent Exhibition of Decorative Arts & Crafts. 1934 March 15, H. Robert Bacher will talk on "the Elimination of Crazing and Seepage in Pottery Fired at Low Temperatures" 3:30 this afternoon at the Pedac Galleries, 30 Rockefgeller Plaza where the annual exhibition of the New York Society of Ceramic Arts is now in progress. 1934, July 10. Will Low is granted patent # Des.92,693 the standing bottoms up beer mug with clothed lady design was mass produced by the McKee Glass Co., Jeannette Pennsylvania, thought the patent number they stamped into the mold, on the underside of the mug, is the patent number of the original bottoms up cup #77,725 ! 1934, August. Arts & Crafts Exhibit at Orange County Fair. “A taste of World’s Fair sights was afforded by a group of articles from the White cloud Pottery at Rock Tavern. In the group was a sample of pieces selected for show at the World’s Fair and likewise samples of exhibits at the Boston Museum of Fine Arts and the Art Center in New York City” ….. Middletown Times Herald. 1935 The four sons now range in age from forty-five to thirty-seven. Mary Holland is in her mid seventies. ……The pottery has been exhibited frequently in New York and until this year was marketed through gift shops. Now a shop has been opened in the old farm house. The process of making a piece of pottery goes like this; A sketch of the article is made, from the sketch a model is made in soft clay. Then from the clay model a plaster cast is formed. Slip clay and water the consistency of thick cream is poured into the cast and allowed to stand until a thin shell of clay forms as the plaster absorbs some of the water. The surplus slip is poured out. The clay coating in the mold is allowed to remain about twelve hours then removed and placed in a drier for twenty-four hours. After it has dried it is sandpapered and all the mould marks removed. It is then decorated, glazed and baked in a kiln with a 2,200 degree heat. The articles range from cocktail shakers through tea sets, vases, bowls, dinner ware, tiles up to 12 x 12 inches in all sizes to order; special order and standard, and lamps to ash trays. 1935, December. From the Middletown Times Herald. … Probably his (Will Low) most unique creation is the well-known Bottoms Up cocktail cups with the patented round base, necessitating complete quaffing of their contents before setting down. Sale of these has been pretty successful, although altercations with patent infringers from Japan and various places in this country have been rather a headache to the Bachers. 1936 Bachers will soon celebrate the twentieth anniversary of their arrival in Orange County. 1936 August 10. The last single Bacher son Will Low Bacher marries Miss Mary McManus. The bride was attended by her sister, Elizabeth McManus and Otto Devereux Bacher was best man. Upon their return from a wedding trip the Nationally kinown artist and his bride will make their home at Rock Tavern where Mr. Bacher is associated with his brother in the White Cloud Pottery Company. 1937, July Cornwall, New York. The Hudson Highlands Art Association holds their third show of the year for professional artists who make their homes in Orange and nearby counties. The Bacher family, consisting of Henry Robert, Helene, Otto D, and Will Low will display their pottery creations. “the Bacher exhibit of White cloud Pottery is a revelation of just what may be accomplished by competent artisans. Vases, bowls, plates, cups and saucers and a score of other decorative and useful articles of fired clay, including a half dozen dainty cups and saucers, the mates of which are on exhibition in Paris, are included in the collection………Will Low spends much of his time working in oils and water colors. Four of his pictures are hung in the exhibition. A large canvas of the Hudson Highlands at Cornwall, which is dominated by the soft blue haze that lends addition beauty to the mountains at certain seasons, has an unusually appeal for the layman familiar with the scene.” * (from the Middletown Times Herald) Google Wikinpedia for info on the Hudson Highlands. Wife of Will Low, the former Mary McManus opens an exclusive women’s dress shop with her sister in nearby Newburgh Hotel, Newburgh N.Y. The wife of Robert Holland, the former Helene Ayres works in the pottery as painter and decorator. 1939 Dec. 3 Sunday New York Times…..Annual exhibition of the New York Society of Ceramic Arts at the Argent Galleries, 42 West, 57th street. It is one of the most interesting displays that the society has presented in recent years…………the debt which American pottery owes to the Orient is seen in the celadon green and gold vases from the White Cloud Farms Pottery…..
1943 Otto Devereux Bacher passes away. timbers became dried from the intense heat of a burning kiln and were easily combustible. 1947 The pottery is rebuilt with three large oil burning kilns. 1950 Dec.1, Holland Robert Bacher is one of two guest speakers for The American Ceramic Society of Metropolitan New York. His subject is White Cloud Faience. Samples of his work will be on display. From his talk; ….The term “Faience’ is a French word from the Italian “Faenza” meaning glazed earthenware, which in turn was derived from the pottery city of Faenza. “Faience Tile”, however, is a term used by the English to denote clay tile used out of doors. Today in the tile trade, Faience Tile is a glazed, weatherproof or vitrified tile…. 1950’s The Apple orchards cease operation by the Bacher family, but are leased for a number of years after that. 1957 White Cloud Pottery discontinues operation. The pottery is later sold to Ron Burke. 1960- early 1960’s the Bacher barn is sold to New York City architect named Russ Glick. He and his partner transformed it into a showplace second residence. Potter Ron Burke stores his dry clay and glaze bags in their basement. Russ Glick and partner become strong vocal opponents of Rockefellers’ eminent domain takeover. 1965, Aug 2. Ron Burke purchases the pottery and all contents on 1.04 acres of land. On the deed the President of White Cloud Farms is Will Low Bacher. It is witnessed & Signed by Eugene D. Bacher. Ron Burke, and wife Tess Burke renamed the enterprise on this date to Rock Tavern Pottery. They create and sell hand made pottery (no molds) & tile. The building measures 40 x 80 feet. Ron builds an apartment in the rear of the pottery and then expands it soon after with a 20 x 20 ft addition to accommodate their growing family. 1967 Ron trades the White Cloud Pottery molds to a ceramics hobby shop in Montgomery, NY for a brand new electric kiln which he still uses today. Ron Burke & wife raise three children while working with the pottery for the next eight years. In 1968, 1970 - 1972 Ron Burke is a visiting Professor teaching Ceramics and 3-D Design for SUNY New Paltz. Tess Burke works part time as a substitute teacher in the Washingtonville School System. 1969, August. On the occasion of the first US Moon Landing… a crew from CBS T.V. News is filming every move in the pottery for the next three days. They had several crews around the country recording what various people were doing at this time of the first moon landing. 1970. Governor Nelson A. Rockefeller had the inspired idea of converting the small nearby Stewart Airport into a fourth super-airport to service metropolitan New York. The Airport would be easily expanded by invoking Eminent Domain wiping out over 8,000 acres of farmland and houses bordering Stewart Airport. (1) Over 6,000 acres would be used as a noise buffer zone with 2,000 acres used for jetport facilities. Note: Some poor sports at the time pointed out that the new International Airport would be half way between the Governors State Capitol Mansion in Albany and the Rockefeller Estate in North Tarrytown, a Beaux-Arts mansion and home to four generations of Rockefellers and mighty convenient for someone traveling between both places as well as cross Country and overseas. 1971, August 14. New York Times front page…. Acting swiftly in the wake of a favorable court decision, the state gained legal possession of 8,657 acres of land west of Stewart airport in Orange County….the acquisition will displace about 1,500 people….An injunction had been sought barring the acquisition by the towns on New Windsor, Cornwall, Montgomery, and several groups and individuals who live near the airport site. Sources in the opposition group said last night that they would continue to battle the airport in courts and other legal channels….. There are about 500 structures on….the flatlands adjacent to the former air base. The state will purchase the property from the owners at prices to be set either by negotiation or by court decisions….. While Stewart International Airport has but one International flight per week. The large amount of acquired land, 8,657 acres, proves unnecessary for runways and super-sonic noise buffer.2011 January 31. New York Times article; An Airport Whose Time May Not Come. with photos of an empty passenger ternimal. "Stewart International Airport, 60 miles north of Manhattan, was virtually deserted on Friday, even as passengers crowded Kennedy, La Guardia and Newark Airports" It attracts fewer passengers in a year than all three airports draw in a single holiday weekend, the article goes on to say. 2009 Gene Bacher, son of Holland Robert Bacher turns 70 years of age, while Ron Burke turns 74 years. Heartfelt Thanks to them both for their kind and generous help and sharing of information for this time line. With out them this history would be lost forever to future generations that study pottery making and the history of the Hudson Valley Area. Ron Burke of Shapleigh, loving husband, father, master potter/craftsman and teacher passed away early Tuesday morning on May 24, 2016, from cancer-related pneumonia. Ron was born in 1935 in Girardville, Pa., to William F. Burke and Anne Yurkonis Burke. He graduated from Elmira (N.Y.) Southside High School and earned a B.S. in education from SUNY Oswego and an MFA from Cranbrook Academy of Art (MI). He married his college sweetheart, Tess, and together they shared 58 years of marriage while living in New York, Michigan, Canada, North Carolina and Maine, and raised three children. Ron began his career as a studio potter while living in Rock Tavern, N.Y. In 1973 he and the family moved to Shapleigh, where he built his studio in the former dairy barn. Ron estimated he made by hand and sold approximately 34,000 clay objects, mostly stoneware vessels (bowls, mugs, plates, vases, etc. ), but also sculptures, bath and kitchen accessories, clocks, tiles, etc. Ron’s work can be found in numerous homes worldwide. His work has been featured in museum, gallery, and studio exhibitions and collections across North America. In addition to his prolific studio work, Ron was also an inspiring teacher who taught at Phillips Exeter Academy and as visiting professor or instructor at the University of Manitoba, SUNY New Paltz, the University of Southern Maine, the University of New Hampshire, Maine College of Art, Portland Pottery, Nasson College, as a resident craftsman and instructor at Penland School of Crafts in North Carolina and at Haystack Mountain School of Crafts. He also ran a master class program for potters at his studio. 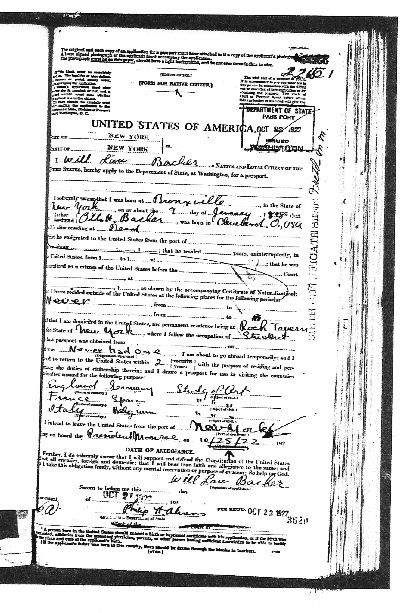 Will Low Bacher , application for a passport on Oct 23 1922 . first page is a letter of correction for date of birth. He was 24 years of age and going abroad for the first time to study art.